Flowing in the wind, growing wild, it looks amazing! Blue Joint Grass is a perennial cool season grass and is one of the most popular herbs on the market. It is tall, robust, resilient and beautiful with long leaf blades. The name Blue Joint is derived from the purplish-blue nodes on the plant's stems. Seedheads are narrow and tall and may be loose or dense. It increases, especially in the first year. It thrives in moist soil. It flowers in late June or July and sees maturity in late Summer. It is beautiful purplish-blue when in bloom and becomes tan as the season progresses. Blue Joint Grass is forgiving of standing water and is an asset along ponds and lakes. Blue Joint Grass plant can tolerate a temporary spring flood up to 6 inches and can withstand saturation of water up to twenty-four hours. It is known to provide soil stability in wet areas. 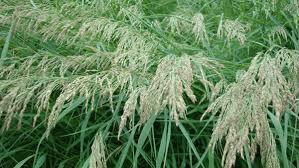 Aside from thriving in moist soil, Blue Joint Grass also possess some degree of shade tolerance but prefers full sunlight. It can withstand Winter weather and can survive temperatures of minus forty to one-hundred degrees Fahrenheit at maturity. Blue Joint Grass plant is very popular with gardeners and landscapers who like to use it in water gardens. Blue Joint Grass is a beautiful grass for filling in large spaces and does well in a natural landscape. It is very much an independent plant and requires little care. Blue Joint Grass is excellent for adding beauty to walkways and borders. Butterflies and birds find it attractive and it looks beautiful as it sways in the wind. This grass has been said to look like a work of art when it is placed around a lake or pond. Blue Joint Grass is a great addition to your lawn or garden.